Spring is in the air, and we couldn’t be happier! The days are getting longer, the sun is getting warmer, and the animals are getting more energetic! After months of cold, dreary days, it’s the time we’ve all been waiting for. Even better, it’s time to start getting your fresh backyard garden going! Have you been thinking of maybe adding more vegetables to your garden, or wish that you could? Maybe you’ve heard that some plants do really well when planted together, and could help you save and create room for more types of plants! You can see a full list of compatible (and combative) plants here and here, but here’s a list of some common plants below! Beans are a pretty popular vegetable to grow. Luckily, they’re pretty compatible with a lot of other popular plants! Look out for garlic, onion or shallots, which stunt the growth of beans. Some plants to invest in planting near your beans would be marigolds, nasturtium, rosemary or summer savory. These four plants deter bean beetles, and could save you time and money of having to buy a bug killer. 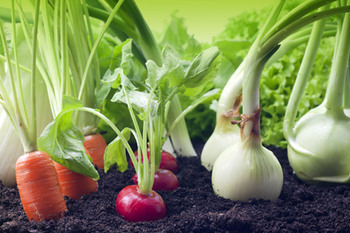 Some other plants that complement beans are: beets, cabbage, carrot, celery, corn, cucumber, peas, and strawberries. Fresh strawberries are really delicious, and make them a pretty popular option to grow. Try to plant a border of thyme bushes nearby, as thyme is a nature deterrent for worms that might destroy your plant’s roots. Other plants that grow well in close proximity to strawberries are beans, lettuce, onion and spinach. Tomatoes may be one of the most popular types of vegetable to grow due to how easy they can be to grow. Try adding a few complementary vegetables and herbs to maximize your garden space! Basil will repel flies and mosquitos to improve growth and flavor. Borage and marigolds will deter tomato worms. Growing dill improves growth and health of tomatoes—but when the dill becomes mature, it will begin to stunt tomato growth, so it’s best to harvest it as soon as it’s ready! There are so many different combinations you can use to protect your vegetables and maximize your garden space! Even better, crowding complementary plants near one another acts as a natural weed repellent by choking out the weed roots! Check out a full list of agreeable plant combinations at the links above from Urban Farmer and Burpee Seeds. When you’re done, stop on in and pick out the seeds for your garden this year at your local Rural King Supply!